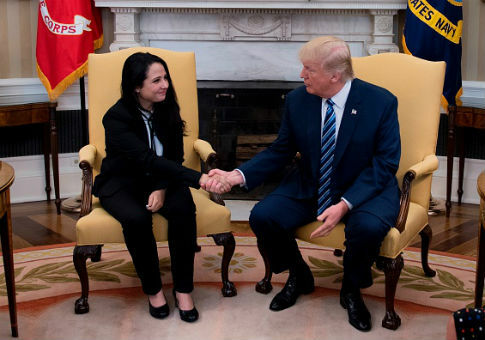 President Donald Trump on Friday met with Aya Hijazi, an Egyptian-American aid worker who had been held in an Egyptian prison for nearly three years, after the Trump administration negotiated her release the prior day. "We are very happy to have Aya back home," Trump said. "It's a great honor to have her in the Oval Office with her brother." Hijazi, 30, is an American citizen and founder of a charity that helps homeless children in Cairo. She landed at Joint Base Andrews outside of Washington, D.C. on Thursday night. Trump's deputy national security adviser, Dina Powell, accompanied Hijazi and her family on a U.S. military plane, according to Politico. Hijazi and her husband were arrested on human trafficking and child abuse charges in 2014, which human rights organizations and U.S. officials said were false accusations. They were imprisoned until Sunday, when a Cairo court acquitted several aid workers of all charges. The administration had quietly negotiated Hijazi's release in recent weeks, according to the Washington Post. White House Press Secretary Sean Spicer said Friday that the president himself had worked behind the scenes to secure her freedom. "The president directly engaged behind the scenes on her behalf and made it clear to the Egyptian president how important it was to him that this American be released and returned," Spicer said. "Today, the president is proud to be welcoming her back to the White House and happy that she is back home on American soil." Spicer added that Trump was briefed on Hijazi's imprisonment early in his term and directed his national security team to "address the situation through diplomatic channels." Trump met with Egyptian President Abdel Fattah el-Sisi in early April in the White House and reportedly brought up Hijazi's case during their discussions. Administration officials told the New York Times that Hijazi's release had been secured before Sisi's visit. The release was in part facilitated through meetings between Defense Secretary James Mattis and the Egyptian president. President Obama had tried to negotiate Hijazi's release for more than two years but was unsuccessful. This entry was posted in National Security and tagged Abdel Fattah al-Sisi, Donald Trump, Egypt, Prison. Bookmark the permalink.